Josh Estep struggled to finish his first race. Estep was in the Air Force and stationed in Florida in 2011 when he signed up for a 10k. The 31-year-old Alexandria, Virginia, resident has come a long way since then. He has run dozens of races around the world, and is working his way through an impressive feat: completing a marathon in all 50 U.S. states, all seven continents and the six world majors. 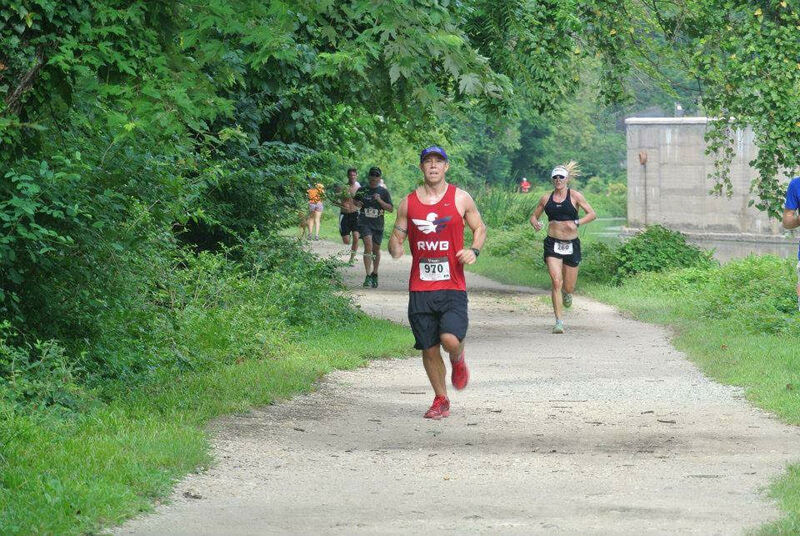 Estep’s running career may not have had a stellar start, but his first winded 10k led him to try another race, the Spartan Race, when he relocated to Joint Base Andrews. And while he admits he was “110 percent fatigued” at the end of the race, the running bug bit him … hard. As of early February, Estep has completed marathons in 43 U.S. states as well as races on three continents. And in case that weren’t enough, he runs ultra-marathons, too. Overall, he has competed in 58 marathons and ultra races. Training for that many races can be a full-time job. But even Estep’s true full-time job as an Arlington County police officer can be a demanding and physical job in its own right. His 10.5-hour evening and overnight shifts can quickly turn into 14 hours if cases are complex or paperwork stacks up. So Estep works to get just the right amount of mileage in before work to guarantee he’s training properly while not exhausting himself. His Arlington County Police Department patrol supervisor, ​Sgt. Don Fortunato said the department supports and encourages him in his goal — but that doesn’t mean his co-workers aren’t a little baffled by his choices. “When he first told me about [his running goals]. I looked at him with a little bit of bewilderment, like, ‘you’re going to do what? '” Fortunato said. And his ambition shows in his police work, too, Fortunato said. ​”When he locks on to something, he’s not letting go of it — he follows through,” he said. What Estep thought would be a lifelong goal to run marathons in 50 states and seven continents, has turned out to be more achievable than he had ever imagined. It just comes down to planning. “I thought, ‘There’s no way I’ll finish this before I’m 70 or 80,’ but going into 2015 and 2016, I just started amping things up,” he said. He runs roughly one or two marathons a month, only venturing to do more when timing and destinations allow (in October 2017, he did four marathons in a month!) In the first six months of 2018, he plans to run nine or 10 marathons or ultra marathons. “I literally have a white board in front of me and I’m always trying to figure out strategically how to do this with money I have and with the time I have,” he said. At times, the cost of such a hobby can cause financial strain, Estep said. But he knows when to cut back in other elements of his life to accommodate for costs of race registration, travel and lodging. In 2017 alone, Estep estimates he spent between $22,000 and $25,000 on race registrations, travel and lodging. And for those who can’t fathom why someone would fork over that much for running? Shortly after Estep’s first marathon, the D.C. Rock and Roll Marathon, he decided to try his first ultramarathon, the North Face 50k. He admits he hadn’t properly trained for the race, and runner’s knee issues forced him to drop out of the race. Still, instead of sulking, he used the DNF as inspiration. 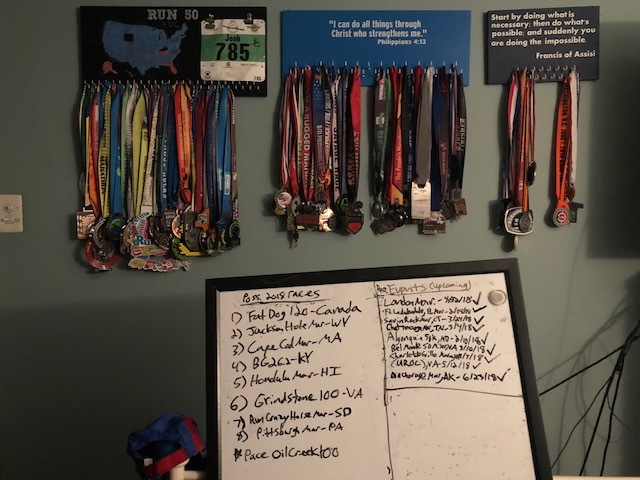 “I took that bib and put it on fridge and used it as a motivator,” he said, adding that seeing it every day helped push him to run his second marathon and sign up (and complete) the North Face 50K a year later. Now, his comrades in the Air Force and his family members motivate him. His running career has in return inspired his mother, brother-in-law and many others to lace up their running shoes and try the sport. “My mom was never a runner, and she started running about 1.5 years ago and started running halves. A year ago, we were having coffee and she said, ‘You and your running, that has inspired me. That’s why I get out there and I map out the miles and I do these races,'” he said of the touching moment. The inspiration is behind his branding too. During races Estep, his family and crew wear “J Fortitude” shirts. It’s a slogan that reaches what he strives for. “The word ‘fortitude’ is about courage and adversity and overcoming obstacles,” he said. When he wears the shirt and promotes his brand, he hopes it resonates with people. It can be seen on his blog as well, where he recaps races and ticks off his latest achievements. When Estep isn’t traveling the world running, he enjoys training locally at Fountainhead Regional Park, Bull Run Regional Park and Burke Lake Park. The self-coached runner likes to mix it up from time-to-time with trails, scenic sites and hills.